Stairway’s collaboration with the Philippine National Police, DSWD and DepEd at the national level has been most beneficial in the development of local Break the Silence Networks referral systems in relation to child sexual abuse cases. 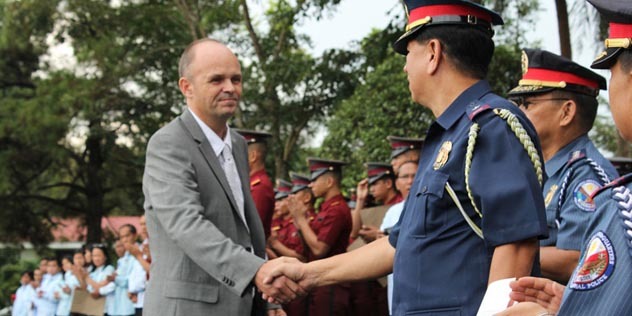 In the Philippines, it is the law enforcement that carries the mandate to respond to cases of child sexual abuse and exploitation, which is the reason that Stairway began to initiate and cultivate a strong partnership with them. We have experienced that while many police officers have the necessary knowledge to handle cases of child sexual abuse, many seem to lack the understanding of how severely this crime affects child victims. It is not uncommon that sexually abused children are further traumatized during the process of reporting at the police stations. There is an evident need to affect change in attitude towards children in general and towards child sexual abuse in particular within the police force. To respect and to treat children as human beings with rights, we need police officers who are technically equipped to handle cases involving minors, and even more so, they need to be truly empathetic towards children and their special needs. Because the intent of our collaboration with the Law Enforcers is aimed more at effecting a change of attitude than simply the passing of knowledge, Stairway’s advocacy and training program with the law enforcement is anchored in creative expressions. Stairway initiated collaborations with the Philippine Law Enforcement at different levels within the sector back in 2005. Our first memorandum of agreement was signed with the National Capital Region Police Office (NCRPO) in 2007, after having conducted several trainings with them in 2006. Through recommendations within the ranks of the directors of the various training schools, we saw a steady increase in the demand for training over the following years. In 2009 we gave training to police cadets and officers in 8 of the 17 schools nationwide. Today, year 2015, Stairway trains every single police cadet in all 17 training schools around the country, reaching around 10,000 future police officers every year. In 2012 Stairway formalized a partnership with DSWD on strengthening and expanding the advocacy on children’s rights and child sexual abuse prevention among the approximately 3 million households that are beneficiaries of the Department’s Poverty Alleviation Program, locally called the Pantawid Pamilyang Pilipino Program. Through the partnership, we aim to reach the millions of children and parents under the program with advocacy on child sexual abuse prevention (CSAP). By 2015, more than 500 Pantawid staff from all regions in the country had been trained by Stairway on how to do CSAP advocacy sessions at the community level within the context of the Family Development Sessions. A most significant aspect of the partnership has been the development of CSAP Modules that are tailor-fit for the Pantawid Program of the Department. The modules will form part of the library of materials on Child Protection for Pantawid’s Family Development Session (FDS) Manual. The CSAP module on children and youth is also envisioned to form part of the materials for the program’s Youth Development Sessions (YDS). In 2015, Stairway Foundation entered into a formal agreement with the Department of Education to develop CyberSafe lessons plans to be used by teachers to integrate online safety in schools nationwide. The CyberSafe program is a web based portal for Online Safety, the first of its kind in the Philippines. The portal will host online child protection materials to be developed by Stairway and the DepEd, scheduled to be launched in 2016. Another important area of collaboration between DepEd and Stairway is in the development of Child Protection Policies at every single school in the country, as mandated by the DepEd. The strategy is for the individual schools to develop their own policies, involving students, parents and faculties in the process. In June 2015, Stairway facilitated “Writeshops” on Crafting School- Based Child Protection Policy for DepEd curriculum writers, and the Break the Silence Network was capacitated to reach out and work with the schools in their respective areas. Deaf children are particularly vulnerable to sexual abuse as compared to their hearing counterparts. One of the largest barriers in raising awareness on child sexual abuse prevention for this sector is the lack of access to information. To address this issue, Stairway has collaborated with NGOs working with the Deaf community. Currently we are working with Support and Empower Abused Deaf Children (SEADC) based in Metro Manila and the Philippine Deaf Accessibility Services (PADS) based in Cebu, both of which are now members of the Break the Silence network. 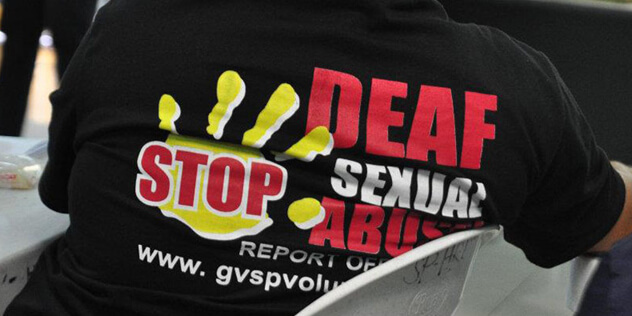 Capacitating these organizations working with the Deaf community, SEADC and PADS have now reached out to hundreds of Deaf children and have handled numerous cases of sexual abuse of Deaf children. The main tools in their child sexual abuse prevention advocacy are the animation trilogies produced by Stairway. All 3 of them have sign language version now.